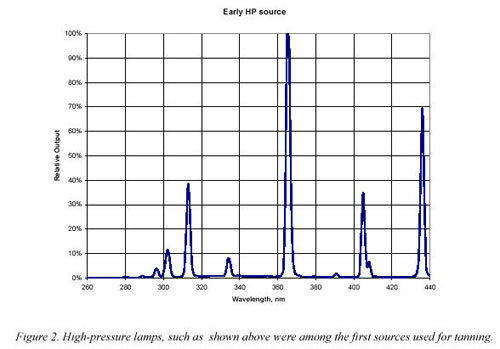 Ultraviolet light is delivered across the spectrum from 200 to 400 nanometers (nm). UV is divided into three categories: UVC, UVB and UVA, with UVC operating at the shortest wavelengths and UVA at the longest. 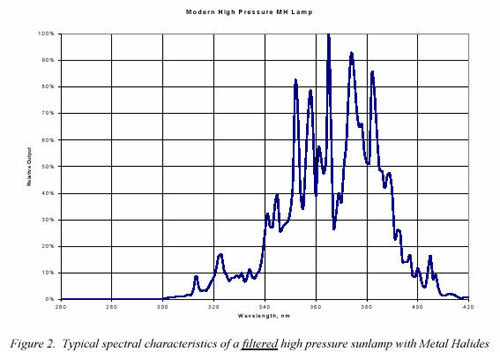 Visible light, from 400 to 700nm, is at even longer wavelengths. 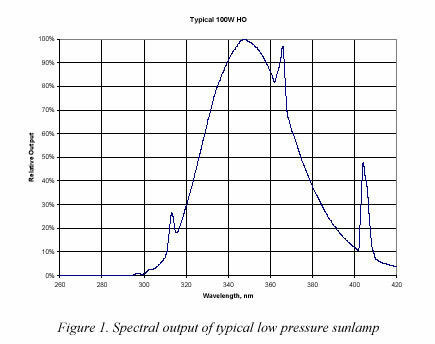 Figure 1 depicts the spectral power distribution (SPD) of a typical Wolff System sunlamp from 250 to 450nm. The blue line represents the output at each wavelength connected by a line to ease display. All of the area under the blue line is output, or irradiance. You can see barely measurable UVC, increasing irradiance in higher UVB wavelengths, significant UVA across that portion of the spectrum, and a small amount of visible light to 440nm. Note that UVA is further divided into UVA2 and UVA1 (more on this later). The SPD tells us about the characteristics of the sunlamp, but doesn’t tell us about its effectiveness at creating our product: a suntan. Some consider UVB as ‘the burning rays’, and we can see there is UVB. Can’t tell how much from the picture, nor can one calculate the UVB:UVA ratio (incorrectly called UVB% by some) without the underlying data. You can tell there is a lot more UVA than anything else, including visible light. To determine the effectiveness of a sunlamp, we need to understand the photobiologic effects of exposure to the irradiance. To do this, we need to look at some action spectra (figure 2). An action spectrum describes an effect on our skin from exposure to ultraviolet energy at certain wavelengths. Here we’ve added the FDA/CDRH* action spectrum for erythema (sunburn) and the CDRH action spectrum for melanogenesis (melanin creation). While the area under the blue line represents irradiance from a sunlamp, the action spectra only identify the effectiveness of measured irradiance, with the top line 1.00E-04 equaling 100%. You can see that UV radiation (UVR) from 250 to 302nm is 100% effective at causing erythema, dropping very rapidly to an almost immeasurable level at about 330nm. UVR at 300nm is far more effective than at 350nm in causing erythema. Similarly, melanogenesis is stimulated more by the lower, shorter, wavelengths. Notice that the action spectra shown do not speak to the whole tanning process. Erythema is not needed and in fact is undesirable. Melanogenesis is a part of the tanning process, but where is pigment darkening? The combination of melanogenesis, pigment darkening and other physiological effects resulting from exposure to UVR make up the entire tanning process. The task for the sunlamp designer is to employ all these factors to develop a product that meets the need of its customers. Certainly a small amount of UVB is good, but lumping all UVB into a single ‘bucket’ does not tell the story as you can see above. Not all UVB is equal. Lower wavelengths of UVA act a lot like upper UVB (or is it upper UVB acts a lot like lower UVA?). Better to limit UVB as much as possible as long as the total effectiveness to the tanning process is not compromised. Consideration should also be given to UVA2, which is most closely associated with elastosis (photoaging, wrinkles). Better to limit UVA2 as much as possible as long as the total effectiveness to the tanning process is not compromised. UVA1 does a good job of darkening the pigment naturally present in the skin or induced through UV exposure. The longer wavelengths of UVA penetrate deeper, thus the tan will be more durable than one induced through relatively higher UVB exposure. Let’s look at the total picture now. The final action spectrum is for tanning (all processes). Note that some visible light has a small tanning effect. It would seem that the best sunlamp would have a spectral character that matches the tanning spectrum, but one must consider the downside to too much erythemal energy and UVA2’s effect on photoaging. Some contemporary sunlamps exhibit a spectral character that delivers more energy in the UVA1 region, with sufficient energy in the UVB and UVA2 to meet the requirements of the tanning patron.